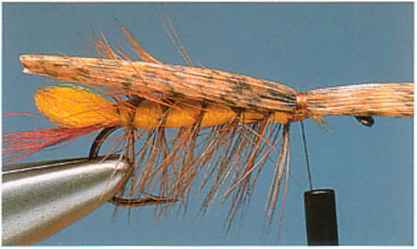 '^f top American fly-tyer Dave Whitlock, who is responsible for a 'trou? number of other extremely effective patterns. 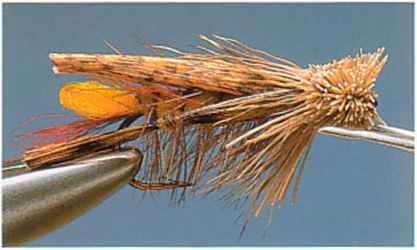 It is a complicated pattern to tie, but well worth the effort, as it is deadly during «r^, h'9h summer when trout are feeding on the natural hoppers. Cutthroat The wing is fashioned from a folded strip of turkey wing quill. To make sure that it retains its shape over many casts and fish, spray the back of the quill with a fixative such as Feather Weld to Rainbow . , , , trout strengthen it. 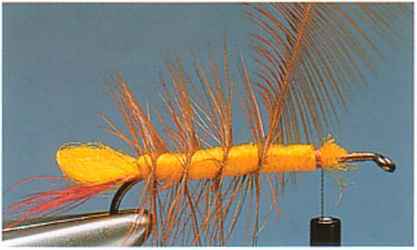 The hopper s two long jumping legs are imitated by tying knots in strips of golden pheasant tail feather. These knots put a bend in the feather and give the impression of a leg joint. The head is constructed Muddler-style from spun and clipped deer hair, but cut to the blunt head shape of the grasshopper. 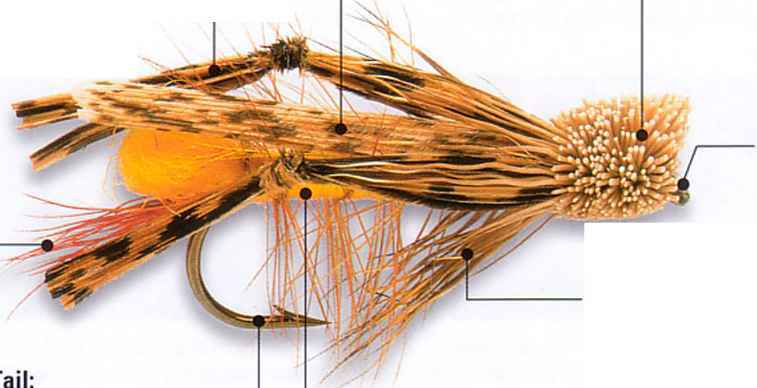 1 Secure the hook in the vise and run the tying thread from the eye to the bend. Catch in a tuft of dyed red bucktail and a loop of yellow polypropylene yarn. Allow the waste ends of both to lie along the shank. 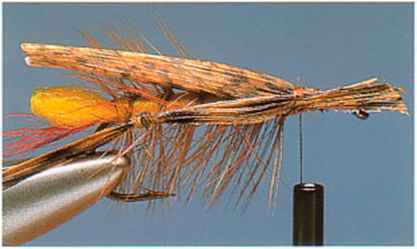 2 At the base of the tail, catch in a brown saddle hackle by its tip along with 4 inches (10cm) of yellow yarn. Cover the waste ends of the previous materials with thread, then wind on the yarn in close turns to form the body. 3 Stop the yarn three-quarters of the way along the shank. Secure the loose end and remove with scissors. 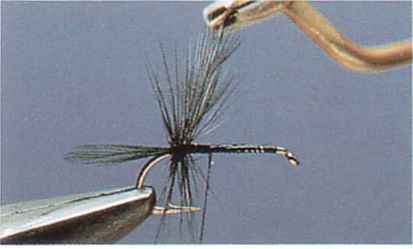 Wind the hackle in evenly spaced turns down the entire length of the body. 4 Secure the loose hackle end and remove. Spray the back of a mottled turkey wing quill with a flexible fixative and allow to dry. Remove a slip three times the width of the intended wing. Roll the slip and fix in place on top of the body. 5 Take two bunches of golden pheasant tail feather. Make a simple overhand knot in each and trim the tips so they are the same length. Catch them in on both sides of the body to mimic the hopper's jumping legs. 6 Trim off the waste ends of the legs before adding a head of natural gray deer hair spun and trimmed in the standard Muddler technique. Cast off and trim the front end of the head square to give the same profile as the real hopper.